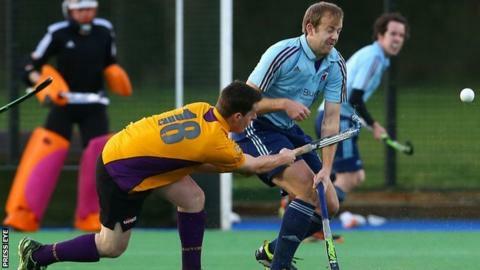 Instonians progressed to the Kirk Cup Final on Boxing Day by beating Belfast Harlequins 5-2 in Sunday's semi-final. Andrew Coulter scored two Instonians goals with James Dowling, Steven Kelso and William Robinson also on target as Andrew Smythe and Tom Brann replied. The scoreline was 1-1 at half-time with Smythe replying to Dowling's opener before Instonians moved 4-1 ahead. Sunday's opening semi-final between Mossley and NICS at Shawsbridge was postponed because of bad weather. However, the second semi-final was able to go ahead at the same venue as conditions improved later in the day. Banbridge beat Cookstown in last year's Boxing Day decider.